At first glance, titling the first intellectual biography of John Berger A Writer of Our Time appears to be a simple homage to Berger's 1958 novel, A Painter of Our Time. Joshua Sperling instead sets out the title as an argument, providing powerful evidence that Berger was indeed a writer of our time. Had Sperling set out to tell the story of 20th century art through Berger's work, the project would likely have been smothered in artifice. 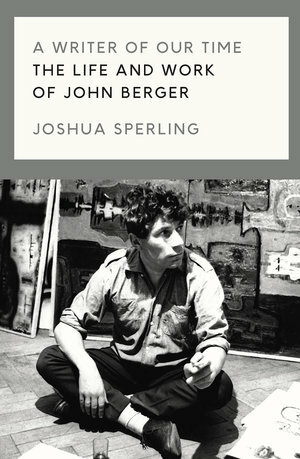 Yet by carefully laying out the path of Berger's artistic and critical career, Sperling provides insight into the artistic and political movements in Berger's lifetime. The political and the artistic are deeply connected in Berger's work, and through this study Sperling shows those interconnections on a broad scale. Berger is himself an engaging figure, but A Writer of Our Time is made richer by the synergies of history it brings to light. Sperling's undertaking is not merely a biography but is more of an art history text that's focused on specific social and political elements as they are connected through Berger's perspective. Berger was a painter, novelist, art critic, photographer, and filmmaker. He was also a Socialist and a Europeanist, and all of these identities color Sperling's narrative. The story opens in 1952 when, at the age of 26, Berger joined the staff of the New Statesman, where he quickly gained notoriety for his brutal critique of the avant-garde. Remarkably, the young art school grad and critic was soon given the opportunity to curate his own exhibition, Looking Forward. Sperling's intent is not to showcase Berger as a young prodigy but rather to introduce an artist and critic so firmly certain of what art should do in the world. Sperling writes that Berger was committed to the idea that art should be of service: "To connect art to social growth and political hope, to causes larger than itself, was in fact to strengthen art, to give it the conviction and purpose from which great works, when they do occur, are made." Berger argued passionately that art, especially when funded by the state, needed to speak to and connect with the working class. Four years later, Berger published A Painter of Our Time, the first of several novels. Sperling offers an extensive discussion of the novel, particularly in placing it in the context of Berger's personal, professional, and political life in that moment. Carrying this method forward through his analysis of Berger's work as a writer, photographer, and filmmaker enables a grounded history of Berger's influence through the second half of the 20th century. Like many enthusiastic members of the New Left, Berger faced the post-war disappointment that Sperling describes so succinctly: "It was not that the revolution of his youth had gone wrong or failed to come, but that the revolutions that did come, whether cultural (from America) or political (in the Eastern bloc), were of the wrong kind, from the wrong quarters." In this post-1968 ethos, Berger embraced his chosen identity as a European, rather than British, writer. Moving away from London meant settling into different cultural and artistic movements. He became obsessed with Cubism and modernism. A reader seeking a clearer understanding of the relationships between 20th century art and politics will benefit from Sperling's explanations through Berger's perspective. As Berger moves on to collaborate with photographer Jean Mohr, the intersections of art and politics move to another medium. Next, Berger became involved with television, serving as a thoughtful and charismatic presenter. While these shifts may seem overwhelming to cover in detail, Sperling gracefully moves the reader through Berger's life with certainty in Berger's character and ways of being in the world. The author's return to fiction was also a return to politics: when Berger accepted the 1972 Booker Prize for his novel G., he gave half of the cash award to the London-based Black Panthers and delivered a controversial acceptance speech. He expressed his scorn for the competitive nature of the Booker Prize that pitted one creative mind against another, and its patron, the Booker-McConnell corporation, which had immense holdings in the West Indies. The publication of G. coincides with the publication of Ways of Seeing and the accompanying four-episode BBC series. In Ways of Seeing, Berger brought to bear the ideological foundations and influence behind visual art, transforming perceptions of art with his foci on Marxism and the male gaze. Berger left behind the ideas he developed for Ways of Seeing, but for the coming generation of academics, he initiated the ideas that were developed into cultural studies and certain strains of literary studies that became fundamental to academic critique of art and culture. It can e difficult to bridge the distance across time to demonstrate an author's legacy. Sperling showcases some of these connections lightheartedly. Mapping out the influence of Berger and his contemporaries, he writes: "Before Jarvis Cocker could sing of class tourists and common people, or Noel Gallagher of not looking back in anger, Tom Maschler first had to gather the anthology of voices for Declamation," an anthology of essays by British working class writers. Brit Pop fans (and others) will easily find themselves in this narrative, as Sperling makes clear the trajectories of Berger's influence. In the concluding chapter, those resonances are central to showing Berger's place as a creative artist and critic of culture. American writers like Raymond Carver and Richard Ford are drawn to England under the influence of Berger's peasant stories in the 1980s. Berger's work is in conversation with bell hooks, Simone Weil, and Susan Sontag. Toward the end of his life, Berger reignited the fires of political and cultural critique that established him as a vital cultural voice, leaving behind not only a legacy but a collection of work that speaks urgently to those looking for a cultural agitator with a complex but valuable point of view.